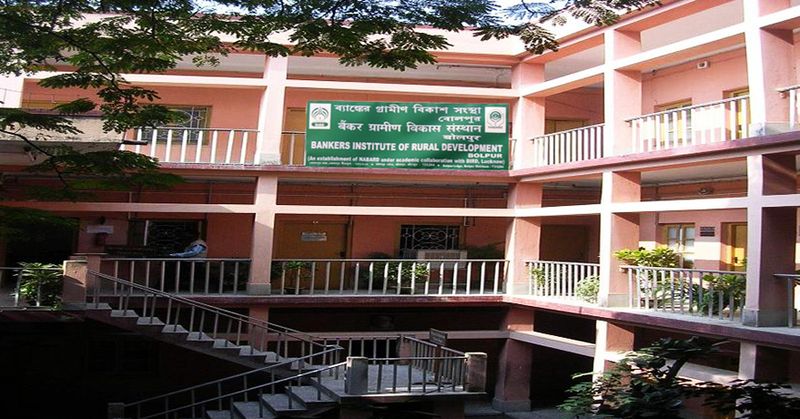 Bankers Institute of Rural Development (BIRD), Bolpur, (formerly known as Regional Training College, NABARD, Bolpur ) established in 1984 by National Bank for Agriculture and Rural Development (NABARD), is engaged in training and capacity building of the officials of the Rural Financial Institutions viz., Commercial Banks (CBs), Regional Rural Banks (RRBs), Cooperative Banks, Government and Non-Government organizations particularly in the States of Assam, Bihar, Chattishgarh, Jharkhand, Odisha, West Bengal as well as for all the north eastern states including Sikkim. BIRD Bolpur functions in academic collaboration with BIRD, Lucknow. The Institute organises in-house and on-location training programmes, besides customised programmes for banks, workshops/seminars and studies of current interest, etc. The Institute has a team of committed Faculty Members who have specialized in economics, finance, project appraisal, behavioural science, banking law and practice, management and organisation development and bank supervision. BIRD, Bolpur is headed by a Joint Director who is a senior level Officer in the rank of General Manager of NABARD with vast experience and exposure both National & International level. Over the years, the Institute has developed expertise in imparting quality training and conducting on-location customised bank specific programmes. On an average, every year, the Institute trains about 2700 bank/NGO/SHG officials, students of Visva Bharati University, BC/BF etc., through various In-house and On-location programmes. The training methodology used by BIRD is participatory, practical and field oriented. Unlike the chalk-and-talk and theoretical methods, training in this Institute is based on cases from real life scenario and solving real problems faced by the client institutions through group discussions, field visit and experience sharing. In 1862, Maharshi Devendranath Tagore, while on a visit to Raipur, district, Birbhum, met with his earlier friend who happened to be the zamindar of Raipur. Maharshi Devendranath expressed his desire to open up an ASHRAM and an educational institution in Birbhum. His friend readily agreed to give the entire barren land to Maharshi Devendranath and registered it in the name of Maharshi Devendranath against Rupee One as a token value. He called his home Shantiniketan (after the name of the house). Shantiniketan became a spiritual centre where people from all religions were invited to join for meditation and prayers. He founded an 'Ashram' here in 1863 and became the initiator of the Brahmo Samaj. Present day Bolpur-Santiniketan is one of the perfect weekend gateway destinations for the people who are eager to travel. It's a great relief from metropolitan's delirious pace and pollution. Rabindranath Tagore’s Visva-Bharati Vishyavidyalaya a central university is the main attraction of the place. It is an International University and a great centre of Oriental education and culture. Bolpur Santiniketan is situated approximately 180 kilometres north west of Kolkata and is well connected by array of trains originating from the stations situated in Kolkata.